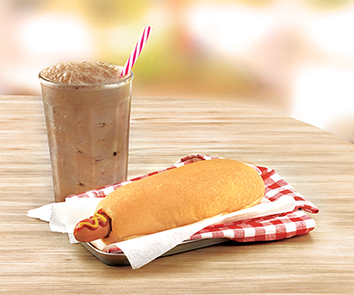 When you’re in the mood for a traditional hot dog, nothing beats one from Wendy's Milk Bar! The combination of our freshly toasted and buttered rolls, your choice of delicious toppings and our exclusive frank recipe, makes a Wendy’s hot dog a taste experience like no other. Pair it with one of our supa tasty shakes to make your taste buds even happier. 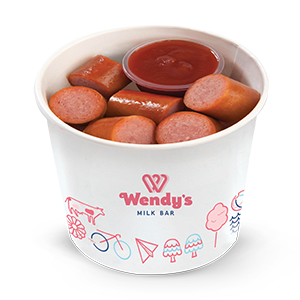 Wendy's Milk Bar Hot Dogs are made with a fresh, toasted bun and a premium Wendy’s Milk Bar frank created to our own exclusive recipe. Enjoy with your favourite shake. The Wendy's Milk Bar Mega Loaded Dog. Our delicious classic Hot Dog heaped with grated cheese, grilled onions and bacon rashers. Load up on extras. Enjoy with your favourite shake. 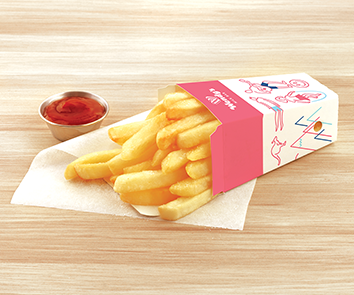 Crunchy hot chips, seasoned with salt and your choice of sauce. Grab them while they’re hot! 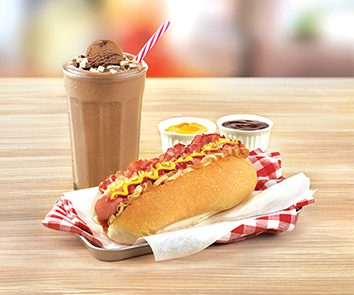 Half a Hot Dog - perfect for our little Wendy's Milk Bar fans! Our delicious frankfurt served in bit sized pieces with ketchup on the side.